As fires raged in Sydney, there has not been a peep out of the mainstream media about the fire hazard to Lucas Heights nuclear complex. Noel Wauchope reports. THE LATEST news on the bushfires raging in Sydney’s south-west is that the firefighters are “cautiously optimistic” and that emergency warning advice has been downgraded to “watch and act”. However, the fire continues to burn in an easterly direction towards Barden Ridge and weather conditions are still dodgy, as Sydney’s record-breaking heatwave looks like coming to an end. It’s been an anxious time — the fire has burned over 2,400 hectares. On Sunday (15 April), more than 500 firefighters in almost 100 fire trucks, along with 15 aircraft, battled the blaze throughout the day. Residents were told that it was too late to leave their homes. Heat from the bushfires was impacting the high voltage lines. There is very little rain forecast over the next few days. So, it has all been a worry. But you wouldn’t know, would you, that the fire is so close to the Lucas Heights nuclear complex? The latest maps shown on The Guardian and NSW Rural Fire Service websites don’t really show how close this fire is getting to Lucas Heights. I have previously written about the safety hazards of Lucas Heights, with its reactor, cooling pond and accumulation of nuclear wastes — the amount of which is not publicly available. The fires have reached about four kilometres from Lucas Heights. Embers carried by wind can form spot fires well ahead of the firefront — even up to 20 kilometres away. 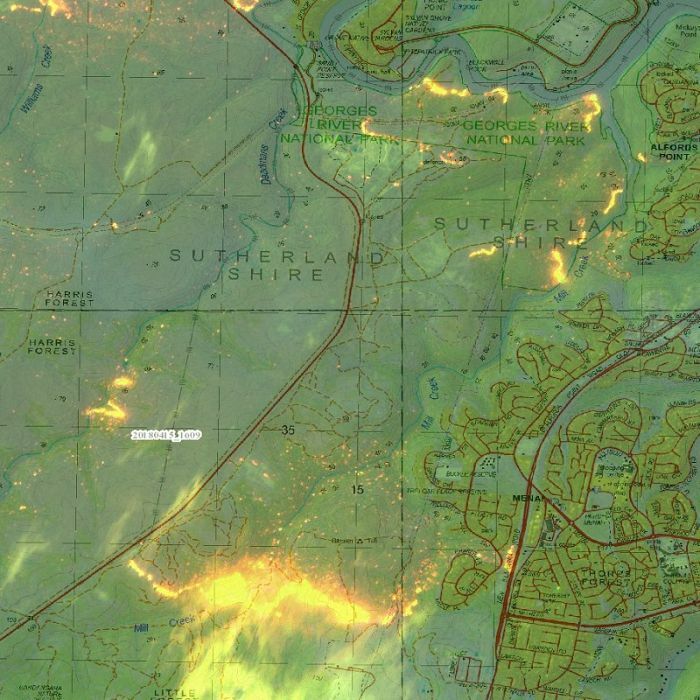 In the dense and rugged bushland, with predicted west to north-west winds up to 30 kilometres per hour – not forgetting that bushfires create their own weather systems – is not that hazardous to the nuclear complex? But we don’t hear a word about this. What makes the silence easier, is that the residential area previously part of Lucas Heights was renamed Barden Ridge in 1996 to increase the real estate value of the area, as it would no longer be instantly associated with the High Flux Australian Reactor (HIFAR) — and now the Opal nuclear reactor. Of course, now, because of the name change, there’s no public awareness that Australia’s nuclear reactor is anywhere near the fires. You can bet that the government wants to keep us all in blissful ignorance. What we do know, is that fires are certainly a hazard to nuclear sites and there is the possibility of radiation release across a wide area, if fire invades a nuclear complex, with the fuel rods in cooling pools at great risk. When fires do happen near a nuclear site, there may be a security panic going on but that is not communicated to the public. Whenever there have been wildfires threatening nuclear sites – in Russia, Europe or the U.S. – the pattern is to downplay, to not mention, the nuclear danger. The publicity pattern is always to ignore the radiation hazard. As though any amount of monitoring is going to help or that any data would be publicly shared. Not a peep about the radiation numbers during the fires in and around Los Alamos, even though they were “monitoring” it. For the current Sydney bushfires, it seems as though there will have been a lucky escape for the communities, despite the fact that two giant aircraft, the DC10 Nancybird and the C130 Hercules “Thor” — normally used for aerial water bombing — were not available to help fight the Sydney fire, having been sent back to the U.S., because by March, the fire risk is supposed to be over. While there was no risk to ANSTO as a result of fires near the precinct, the organisation decided to close the campus to all non-essential staff tomorrow to help minimise traffic impacts in the area. The Australian Nuclear Science and Technology Organisation (ANSTO) at Lucas Heights will be closed on Monday to all non-essential staff. ANSTO released a statement late today saying there was no risk to ANSTO as a result of fires near the precinct but the organisation decided to help minimise traffic impacts in the area. “ANSTO infrastructure including the OPAL reactor is protected by numerous fire safety systems, policies, plans and arrangements to ensure there is never any risk to operations or safety,” the statement said. “The OPAL reactor is at power and operating normally. “Some 1,200 people work at the Lucas Heights campus. Based on current advice, and to minimise local road and traffic impacts, we have advised ANSTO staff who are not performing essential services to work from home. “All contractors, tenants and construction workers on our building projects are advised not to attend our campus tomorrow; and the childcare centre has been closed. “As a precautionary measure, the ANSTO Operations Centre was activated yesterday, and continues to monitor the situation. Russian President Vladimir Putin warns of global ‘chaos’ if West strikes Syria again, ABC News 16 Apr 18, Russian President Vladimir Putin has warned that further Western attacks on Syria would bring chaos to world affairs, as Washington prepared to increase pressure on Russia with new economic sanctions. “……Scientists from Virginia Polytechnic Institute and State University have created simulations of a potential outcome if an attack did occur, and found the best course of action for people was to take shelter first and then take steps to escape afterwards. Those who tried to seek out family members and “aid and assist” others were more likely to die. In the study, it showed some people would look out for family, while others wold panic and run blindly away. When humans carried out “shelter-seeking, evacuation, healthcare-seeking, and worry combined,” they were more likely to survive. The simulation, which was first revealed by Science Magazine, shows that venturing away from a safe place leaves civilians subjected to a higher dose of radiation, which would likely prove fatal. With President Trump’s consistent tweets threatening action against Russia and North Korea in a game of who has the bigger artillery, a dystopian future seems more and more possible. The map shows the extent of the fireball, radiation, shockwave, and heat spawned by different weapons, from the 15 KT ‘Little Boy’ dropped on Hiroshima to the largest weapon in the USSR’s arsenal, the 50,000 KT Tsar Bomba. For example, if North Korea dropped the Hwasong-14, a 150 KT yield nuclear weapon on Sydney’s CBD, there would be more than 77,000 fatalities and 156,000 injured. The radiation from the blast would exceed 12 square kilometres and go further depending on wind patterns. 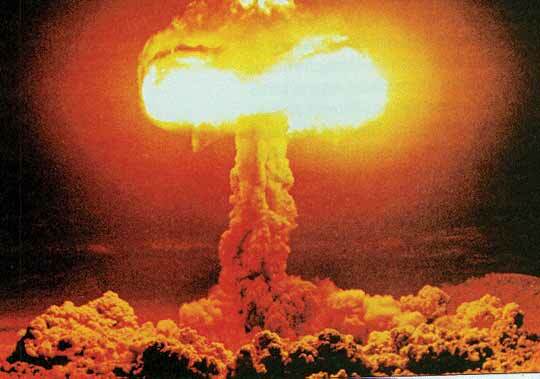 If Vladimir Putin dropped a 50,000 KT Tsar Bomba (Reportedly the biggest in his arsenal) on Sydney, there would be 1,513,303 fatalities, 1,111,725 injuries and radiation exceeding 80 square kilometres. If the Aussies pissed off the US and Trump attacked us, it would most likely be with the 300KT W-87, which would kill an estimated 114,374 Sydneysiders, injure more than 227,000 and cause radiation exceeding 15 square kilometres on initial impact. While scary to think about, it’s an important thing to get your head around in Trump’s 2018. Without coming off as alarmist we should understand the exact magnitude of a nuclear blast and how damaging it can potentially be. New survey reveals energy efficiency enjoys extremely high levels of public support. But that’s not why we should be embracing it. ACT unveils major push into electric vehicles, including zero emission mandate for government fleets, charging infrastructure, use of transit lanes, salary sacrifice for electric bikes, and studies on using EVs and their batteries to help manage the grid.